Click the button below to add the Christ in His Saints to your wish list. 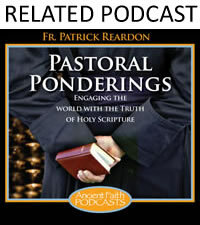 In this sequel to Christ in the Psalms, popular pastor and scholar Patrick Henry Reardon once again applies his keen intellect to a topic he loves most dearly. 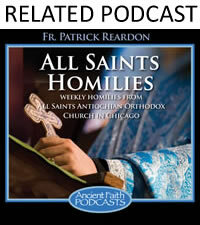 Here he examines the lives of almost 150 saints and heroes from the Scriptures, everyone from Abigail to Zephaniah, Adam to St. John the Theologian. This well-researched work is a veritable cornucopia of Bible personalities: Old Testament saints, New Testament saints, "Repentant saints", "Zealous saints", "Saints under pressure" . . . they re all here, and their stories are both fascinating and uplifting. But Christ in His Saints is far more than just a biblical "who s who." These men and women represent that ancient family into which, by baptism, all believers have been incorporated. Together they compose that great "cloud of witnesses" cheering us on and inspiring us through word and deed. Appropriate for Great Lent or any other time of the year. 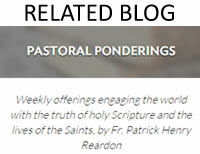 About the Author: Patrick Henry Reardon is pastor of All Saints' Orthodox Church in Chicago, Illinois, and a senior editor of Touchstone. He is the author of Christ in the Psalms, The Trial of Job, Creation and the Patriarchal Histories, as well as more than 500 articles, editorials, and reviews, published in Books and Culture, Touchstone, The Scottish Journal of Theology, The Catholic Biblical Quarterly, Pro Ecclesia, St. Vladimir's Theological Quarterly, and other journals on three continents.